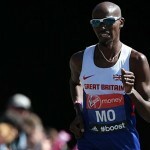 Mo Farah was left disappointed on Sunday as his marathon debut did not go quite as he hoped. 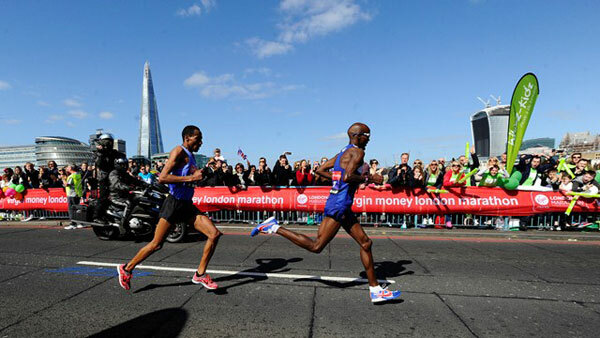 The Great Britain multiple track champion finished eighth in the Virgin Money London Marathon in 2:08:19 as Kenya’s world record-holder Wilson Kipsang triumphed in a course record of 2:04:09 as he defended his title. 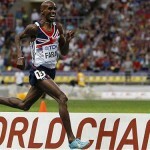 Farah’s mark is an English record but he said: “It was pretty tough. I am quite disappointed but you try things and if they don’t work, at least you give it a go. “I missed one drink station but it was really just the pace. “The pacemakers I had were just slightly ahead of me but you learn – life goes on. Making that transition from the track to the road can be straightforward, but it is when the step up to the marathon is taken that the whole aspect of your running ability is moved to a new level. So many have succeeded in doing so; from Paula Radcliffe, back in 2002, when she won in London in her first race over 26.2 miles, to Ethiopian Kenenisa Bekele only a week ago as he triumphed in Paris on his debut. His time was 2:05:04, a course record and the sixth quickest by a marathon debutant. But it was the 29-year-old British record of 2:07:13 that became Farah’s main challenge in a week where his name had not been out of the headlines in one of the great occasions of the sporting year in Britain. As Kipsang said beforehand, it is about how runners who are used to going fast actually have to slow down a bit and pace themselves differently. That was one of the big challenges facing Farah, but he chose to stay with the second pack and not go with the leaders that included Kipsang and Uganda’s Stephen Kiprotich, the Olympic and World marathon champion. In the end Farah could never catch the leaders who had, among others, Ethiopian Haile Gebrselassie, the former world record-holder, operating as one of the pacemakers. 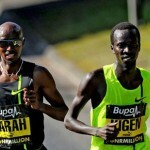 At halfway, as the leaders went through at 1:02:30, Farah was 38 seconds behind. He was running steady and though he was 50 seconds behind them at 17 miles, he was on course for the European record of 2:06:36 that Portugal’s Antonio Pinto had set on this course 14 years ago. But over those last nine miles, Farah, the triple European 5000m champion and Olympic and World 5000m and 10,000m champion, did not have enough to sustain that speed. Kipsang and fellow Kenyan Stanley Biwott took total control as it became a two-man race, before the world record-holder exerted one final push. 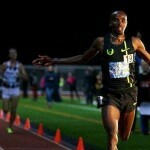 Biwott was second in 2:04:55 with Ethiopia’s Tsegaye Kebede third in 2:06:30.